New Raceroom Series starting November 05! Sim Racing System Sim Racing System News New Raceroom Series starting November 05! We are delighted to announce the new series for Raceroom, starting November 05th! SRS will feature a DTM 2016 series on fridays, saturdays and sundays at 21:00 GMT. This races will feature a 1hour race with mandatory pitstop. 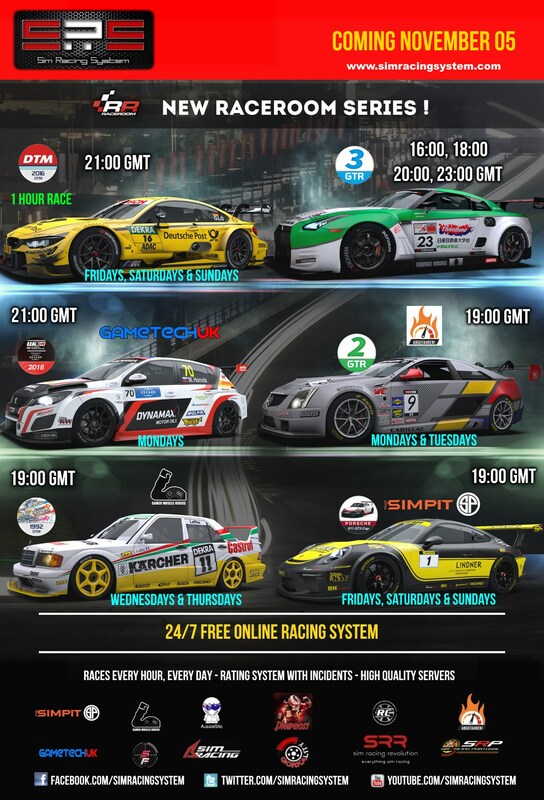 GTR 3 daily series running 10 min Qualify + 20 min races at 16:00, 18:00, 20:00 & 23:00 GMT. Something is wrong with the GAMETCHUK series. Time and date are not correct. First race Suzuka or Brands Hatch? Time 21:00 GMT or 19: 00GMT?